Pigmyweed is circumpolar annual, succulent-leaved herb that is found in North America in western, southern and eastern US states and most Canadian provinces (USDA 2011). In British Columbia, it is found infrequently in the southern part of the province, in wet vernal pools and mudflats in the lowland zone. 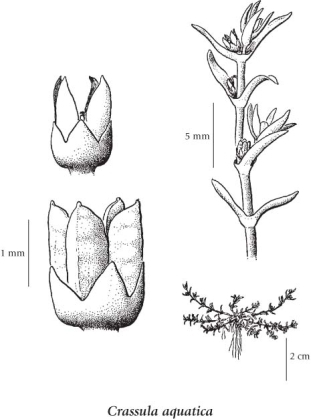 In his rare plants of the Fraser Valley article, Lomer (2011) says: "A local plant of muddy sites usually along major rivers in [southern] BC such as the Columbia, Fraser, Harrison, Pitt and Pend d'Oreille. It is abundant and co-dominant in tidal mudflats along the lower Fraser from Steveston to Langley and along the Pitt River to Pitt Lake, as well as east to Harrison Lake (UBC: Straley 6267). It is widespread in southern BC from Vancouver Island to the Rocky Mt Trench. Now known from enough sites that it was recommended for removal from the BC rare plant tracking list." Extracted from Botanical Electronic News #432, January 2011, with permission. Weak annual herb, rooting nodally; stems ascending or erect, freely branching, 2-6 cm tall/long, glabrous. Opposite, entire, succulent, linear to linear-oblanceolate, 3-6 mm long, with heart-shaped, sheathing bases. Inflorescence of single flowers in the leaf axils; flowers usually 4-merous, greenish, short-stalked but lengthening in fruit; calyces cup-shaped; petals exceeding the sepals, whitish; stamens shorter than the petals. Follicles, less than 2 mm long, purplish, 6-12 seeded. Wet vernal pools and mudflats in the lowland zone; infrequent, scattered through S BC; circumpolar, N to AK and NT and S to CA and MX; Iceland, Eurasia.